Describe the benefits, risks, and side effects of long-acting reversible contraceptive methods. Identify potential candidates for long-acting reversible contraception. Discuss myths and other potential barriers to the use of long-acting reversible contraception. Menopause, Hormone Therapy, and the WHI-What Have we Learned? Larry R. Glazerman completed medical degree at Jefferson Medical College, Philadelphia and residency in obstetrics and gynecology at Lehigh Valley Hospital, Allentown, PA. In May 2010 he received an MBA in Healthcare Administration from DeSales University, in Center Valley, PA. He is board-certified in obstetrics and gynecology, and also certified in laparoscopy and hysteroscopy by the Accreditation Council for Gynecologic Endoscopy. His special expertise and interest is minimally invasive gynecologic surgery as well as family planning. From 2008&dash;2012, he was faculty at the USF Morsani College of Medicine in Tampa, and was director of an AAGL sponsored Minimally Invasive GYN Surgery Fellowship at USF He is currently the medical director at Planned Parenthood of Delaware, and is clinical associate professor of Ob-Gyn at his alma mater, Jefferson Medical College. He is a member of numerous professional societies, including the American College of Obstetrics and Gynecology, AAGL&dash; Advancing Miminally Invasive Gynecology Worldwide, and the International Society for Gynecologic Endoscopy, where he served on the board of directors from 2008 - 2011. Bratislava, Slovakia - Bratislava is the capital of Slovakia and the country's largest city. Bratislava is in southwestern Slovakia on both banks of the Danube River. Bratislava has a very pleasant medieval inner city with narrow, winding streets, a hill-top castle next to the river Danube, and many historic churches and buildings to visit. The old town is centered on two squares, Hlavne namestie (main square) and Hviezdoslavovo namestie (Hviezdoslav square, named after a famous Slovak poet). Budapest, Hungary - Budapest is the capital of Hungary. As the largest city of Hungary, it is the country's principal political, cultural, commercial, industrial, and transportation centre. 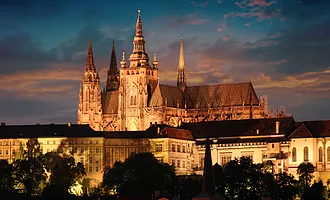 Cited as one of the most beautiful cities in Europe, its extensive World Heritage Sites includes the banks of the Danube, the Buda Castle Quarter, Andrássy Avenue, Heroes' Square and the Millennium Underground Railway, the second oldest in the world. Dürnstein, Austria - Dürnstein is a small town on the Danube river in the Krems-Land district, in the Austrian state of Lower Austria. It is one of the most visited tourist destinations in the Wachau region and also a well-known wine growing area. Visitors can see the crooked medieval streets, quaint 16th and 18th century town houses, colorful wine taverns as well as the ruins of a castle, where Richard the Lionhearted was allegedly imprisoned. Esztergom, Hungary - Esztergom is a city in northern Hungary, 46 km north-west of the capital Budapest. It lies in Komárom-Esztergom county, on the right bank of the river Danube, which forms the border with Slovakia. The biggest church of Central Europe can be found in Esztergom. The building is 100m in height and boasts the worlds largest altar piece. Organ and choir concerts attract many visitors inside the interior. Other attractions include Watertown with its two-towered church, the Kereszteny Museum and the imposing Town Hall. The views from Szent Tamas Hill are stunning and the Szechenyi Square and surrounding streets offer a quaint but elegant vista. Linz, Austria - Linz is the third-largest city of Austria and capital of the state of Upper Austria It is located in the north centre of Austria, approximately 30 km (19 mi) south of the Czech border, on both sides of the river Danube. Linz is largely an industrial student town; however it has many historical buildings and numerous churches. Visitors can view many splendid town residences, chapter houses and the little lanes of the old town which lie directly at the foot of the castle. The large, baroque main square is also worth a visit. Melk , Austria - Melk is a city of Austria, in the federal state of Lower Austria, next to the Wachau valley along the Danube. It is best known as the site of a massive baroque Benedictine monastery named Melk Abbey. Passau, Germany - Passau is a town in Lower Bavaria, Germany. 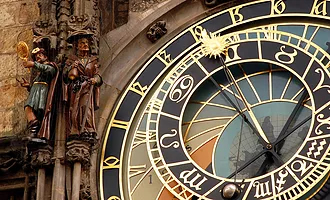 It is also known as the Dreiflüssestadt or "City of Three Rivers," because the Danube is joined at Passau by the Inn from the south and the Ilz from the north. Regensburg, Germany - Regensburg is a city in Bavaria, Germany, located at the confluence of the Danube and Regen rivers, at the northernmost bend in the Danube. It is one of Germany's oldest towns, founded by the Romans in 179 A.D. Regensburg is has many landmarks, most dated to the Middle. Since July 2006 the old city of Regensburg has been a UNESCO World Heritage site. Vienna, Austria - Vienna is a unique blend of the historic and the modern with a wealth of architecture and artistic and musical heritage. Many of the worlds most important composers, including Beethoven and Mozart, have lived and performed behind Viennas Baroque façades. In addition to this Baroque splendor, there are excellent examples of Art Nouveau architecture . Mozart Suite - Stay in one of our elegantly appointed Amadeus Suites and enjoy unexpected little luxuries. 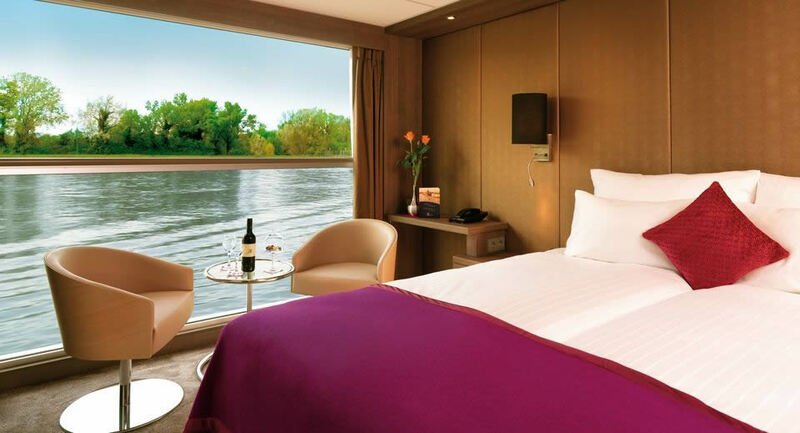 Feel the cool breeze as you sail down the river on your own private walk-out exterior balcony with outdoor sitting. Suites have a Comfortable corner sofa, luxurious bathroom, mini-bar, walk-in wardrobe, choice of bed configuration (double or twin bed), flat-screen television, individual climate control, en-suite bathroom with shower/WC, bathrobe, hair dryer, direct dial telephone and in-room safe. 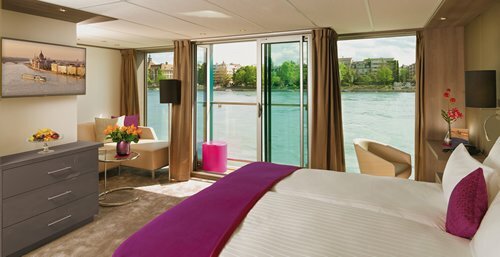 Mozart (A1) - Drop-down panoramic window, mini-bar, walk-in wardrobe, choice of bed configuration (double or twin bed), flat-screen television, individual climate control, Spacious en-suite bathroom with shower/WC, hair dryer, direct dial telephone and in-room safe. 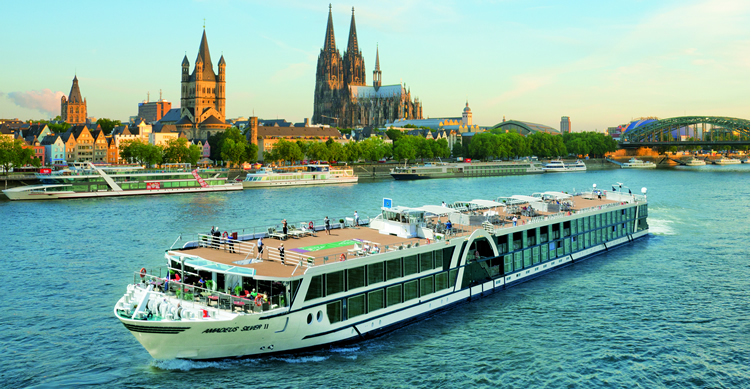 Strauss (B1) - Drop-down panaramic window, mini-bar, walk-in wardrobe, choice of bed configuration (double or twin bed), flat-screen television, individual climate control, Spacious en-suite bathroom with shower/WC, hair dryer, direct dial telephone and in-room safe. 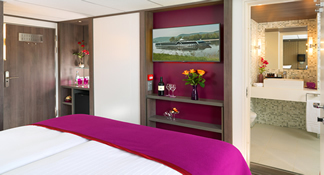 Haydn (C1) - Panoramic window (cannot be opened), walk-in wardrobe, choice of bed configuration (double or twin bed), flat-screen television, individual climate control, en-suite bathroom with shower/WC, hair dryer, direct dial telephone and in-room safe. Prices are Per Person, Double Occupancy. Prices are subject to change. 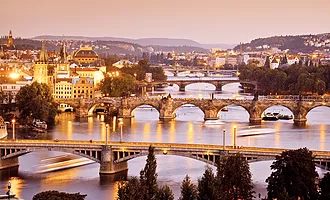 Private guided city walking tour of Prague&apos;s Old Town including inside visit to Municipal House, followed by local beer tasting (can substitute wine or soft drinks) and snacks. Listening devices for city tour for group of 6 or more. Accommodations and meal venues are subject to availability at time of booking.